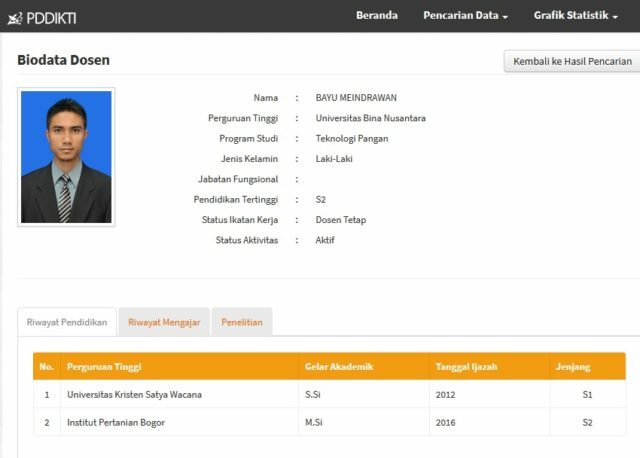 Congratulations to Bapak Bayu Meindrawan on getting registered at PDPT/Forlap DIKTI (Indonesian Goverment Higher Education Database). This means that he is officially holding his “license to teach” 🙂 with additional perks of permission to submit DIKTI Research Grants, and one step closer to advancing his career to further academic ranks (JJA, jenjang jabatan akademik). Once again, congratulations and good luck on working together in the department of Food Technology to the betterment of Binus University and Indonesia.